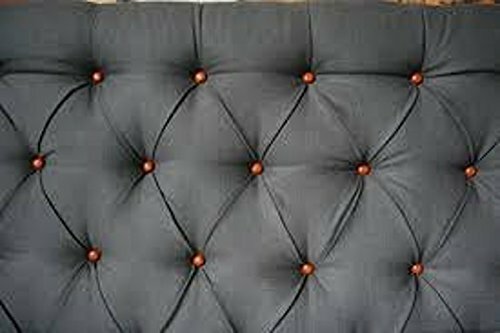 My tufted headboard projects are original and completely hand designed, with you, and your decor in mind. These custom headboards come in a diamond, or square pattern. It can be hung on the wall, or just sit on your bed frame against the wall. I can add legs to attach to a bed frame. They are designed with fabric to match your decor, add uniqueness, and come in a variety of fabric patterns, including solids. These headboards do not touch the floor, they can hang from your wall with wall hooks, and can be designed in any size. Bed Frame Sizes: Toddler- 27"w x 26"h Twin- 39"w x 26"h Twin XL- 39"w x 26"h Full- 54"w x 30"h Queen- 60"w x 30"h King- 76"w x 30"h Cal King- 72"w x 30"h Colors may vary slightly due to lighting. A custom bed frame can be purchased separately. Please check out my other products for details. These custom order sales, and shipping are final. Shipping is nonrefundable on all orders. For fabric options, please copy, and paste the following links: www.hobbylobby.com/Fabric-Sewing/Apparel-Fabrics/c/6-133 or www.hobbylobby.com/Fabric-Sewing/Home-Decor-Fabrics/c/6-142 Then choose the fabric pattern you want. Please place the link to the fabric of your choice in your message, or email it to dechellesdesigns [!at] gmail.com. If more are needed, please let me know.